Dogs notice so much more than we tend to. If you come home with your dog and someone’s left a parcel on the table - doesn’t your dog race over to inspect it immediately? Anything that’s different or out of place will be subject to scrutiny. The dog has your home all mapped out in his mind. He knows just where everything is - or where it should be. And reflecting on this will help you “clean up” a lot of the things you ask your dog to do. Maybe when he first learnt them he seemed to do ok.
Maybe as time has gone by, his responses are slower and woollier. And just maybe ... it’s not his fault? You may have heard that statement on your training journey with your dog. It means that if they learn how to sit, in the kitchen, with the oven on their left and the fridge on their right, they may struggle to sit when you ask for it somewhere else. “Where’s the oven? Where’s the fridge? Oh no! Where am I meant to be?” Dogs are, as I said above, very locationally-aware. So it’s normal training practice to teach an action, then “generalise” it by doing it in lots of different places - the bedroom, the garden, beside the car, on a walk. Gradually your dog realises that Sit simply means placing his bum on the floor, immediately, regardless of where he is (this could be a lifesaver one day). This is the way to get an all-weather, instant, Sit. Similarly, learning to sit should also include learning when to release. So that “SIT” means “Sit till I tell you otherwise”. No need to yell “STAY STAY STAY Ah-ah!” with accompanying wagging finger, at your dog, if he knows that he only moves from his sit when released. This is a detail that most pet-owners forget to teach - or rather, they don’t know they need to teach it in the first place. But doesn’t it make a lot of sense once you think about it? If you look at it from the dog’s point of view, is a Sit something you do for a split-second before jumping up again? Or is it a careful placing of the bum on the floor … till you feel like moving? Or does it mean what it says? “Sit.” Just sit! There's a difference for us in whether we touch a button on our phone, or press it, or hold it down. We have different words to describe those actions, otherwise it would be very hit and miss. If we’re not clear in what we understand and mean, we’re not going to be able to convey that information to our dog - who will be so happy to oblige once he knows what it is that you want! Maybe you’re thinking that this is a fuss over nothing - that as long as when you say “Sit” your dog (eventually) parks himself, however briefly - you’re happy? But wouldn’t you and your dog both be much happier still if you were both clear about what you wanted - about what will earn your dog a reward, in other words? It’s clarity that will transform your dog training from “you against him”, to a team, happily co-existing and walking this earth together. Knowing just what you mean when you ask him to do something, will enable your dog to hit the spot every time. He can anticipate your needs (that’s terrific … except in competition, where anticipation will lose you buckets of points! ), and he now has a sure way to please you and earn a reward. So do I have to keep feeding my dog all day long? 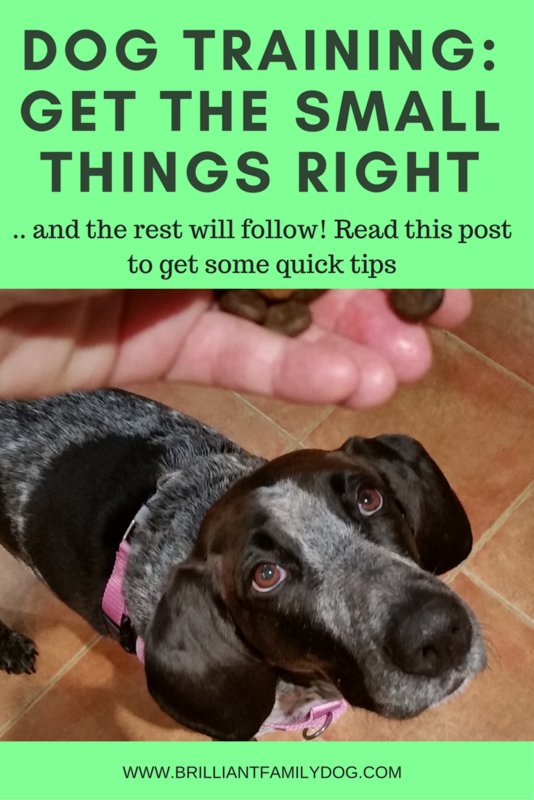 Keep in mind that a reward is whatever your dog finds rewarding! For many dogs food of some kind will head the list, with tasty soft food (cheese, for instance, or sausage) way up at the top. But you need to find out what else your dog finds rewarding - Running? Going out to the garden? Sleeping in the sunshine? A cuddle on the sofa? Chasing a toy? Retrieving? Nosework? A car ride? My own four dogs would list their favourite rewards in very different orders from each other. For Cricket the Whippet, snuggling under the duvet has got to be up there, while Rollo the Border Collie loves every opportunity to stalk and herd his chickens in the garden (don’t worry, he never touches or upsets them). For Lacy and Coco, my more worried dogs, proximity to me, and interaction with me, is highly-valued and a reward in itself. Do I really need to train my dog all the time? The easiest way to train your dog (and I’m all for easy answers) is what I call “All Day Training”. And while this doesn’t take up much time - seconds, in fact - it does require you to be clear about what it is you want. And keep in mind the sad fact that something you’ve taught, and that your dog does perfectly, will gradually deteriorate. Things don’t stay static, so your dog’s sit is either getting worse or getting better. Think about it - the last few times you asked your dog to sit, what happened? Be honest! Did it take several “Sit’s” for anything at all to happen? Did he jump up again as soon as you moved? This sort of creeping disintegration of what you thought your dog knew happens to the best of us if we are not vigilant. I’m as guilty as you are! I noticed recently that while Coco Poodle has a nice instant drop at a distance … it was only most of the time, not all of the time, and he had a tendency to move as soon as I did. So back to the drawing board! It’s taken only a short time giving his instant down a bit of focus on walks for us to have his “drop on the spot and stay dropped” back in full working order again. And whose fault was it that it had gone wobbly? I had not been clear in what I wanted, and in what was reward-able. Once I restored clarity to the action, it was easy for Coco to oblige and get it right. Is it me or is it the dog? So have a critical look at what it is YOU are doing with your dog. It’s so easy to blame the dog - when it’s ourselves we should be looking at! The biggest thing I have learnt on Beverley Courtney's course is the need for me to speak dog - understand how they think and tune in to that.